Damien Andrew Maddox (left) and Sean Pendleton (right) are charged with receiving stolen property and fleeing and evading. LOUISVILLE, KY (WAVE) – Two men accused of crashing into a Louisville Metro Police Department cruiser with a stolen vehicle appeared in court Wednesday morning. A prosecutor believes Damien Maddox and Sean Pendleton were passengers in the car spotted by a LMPD officer early Tuesday morning. On Wednesday afternoon, LMPD arrested the driver of the vehicle, identifed as Jordon Monahan, 20. 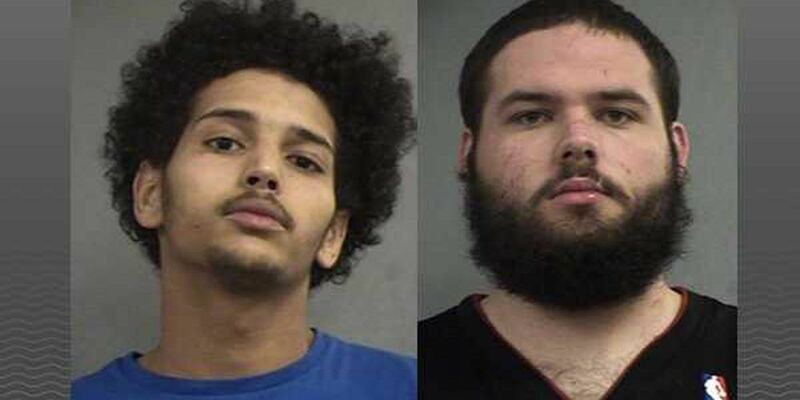 The officer noticed the suspects inside a suspicious, stolen vehicle behind a motel on Wattbourne Lane at Watterson Trail around 2:50 a.m. Tuesday, according to LMPD spokesman Dwight Mitchell. Initially Mitchell said one of the men shot at the officer and the officer returned fire before the suspect vehicle took off and hit the officer's cruiser. Tuesday afternoon Mitchell said, "We continue to investigate exactly what took place prior to our officer firing her weapon. A part of this investigation will include determining if shots were fired at the officer prior to her being struck and injured by the suspect vehicle." Police located the stolen vehicle unoccupied in the 4300 block of Dalewood Place. Maddox and Pendleton were found in a tree line behind the Meijer on Hurstbourne Lane. Mitchell said the suspects were not injured. Both Maddox and Pendleton were charged with receiving stolen property and fleeing and evading. Their bonds remain at $1,000 each. Monahan is expected to appear in court on Thursday. The LMPD Public Integrity Unit is investigating. Anyone with information is asked to call the anonymous police tip line at (502) 574-LMPD.